There are quicker and easier ways to travel to Dorset, but when your starting point is Barcelona, three taxis, a plane and two trains are probably about normal. A 45-second sprint from one of those taxis to one of the trains, including ticket purchasing and ticket-barrier traversing, without getting trapped in the train’s closing doors, possibly could have been avoided with a little better planning (or just less traffic on Britain’s motorways), but I got myself there, which was the main point. A to B couldn’t have been in starker contrast, and not just because I swapped sizzling Spanish sun for a somewhat chillier Southern England. In Barcelona I’d been ensconsed in the city’s newest boutique hotel, Ohla Eixample, where concrete floors and a sleek rooftop pool come as standard. In Dorset, I was headed for a tent. Thankfully, not just any tent. A Loose Reins tent, and with it three days of off-the-grid living. You don’t need me to tell you that the glamping trend continues apace, with no sign of our love affair with outdoor living subsiding, as long as it’s served up with a healthy dosing of cosy interiors and nice beds. 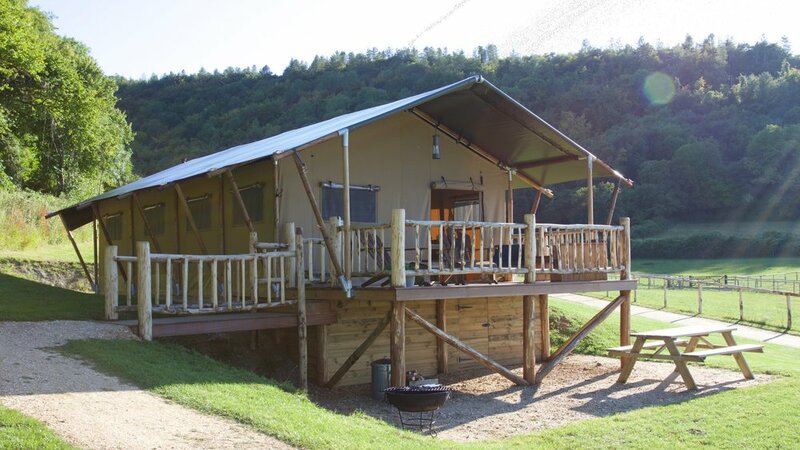 With that trend, however, has come a glut of canny entrepreneurs bunging a few expensive tents up in their fields and marketing them as a luxury experience. The safari tents in this little pocket of Dorset, however, are the antithesis of that: clearly a labour of love, with the owners having done them up as if they planned to live in them themselves, and ensured every detail, from the match boxes to the bed linen, is a delicious delight. 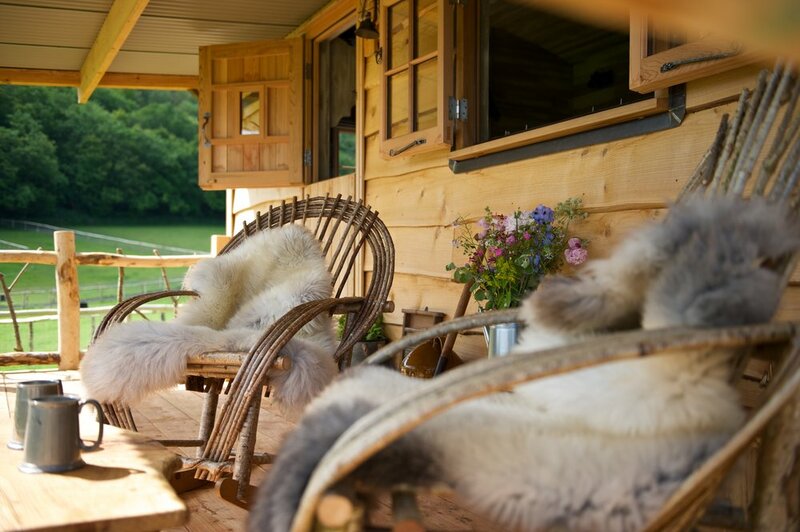 As the name suggests, there’s a horsey side to this glamping destination. Horses, for many, being the whole point of going, with lessons and hacks available on owner Michelle’s string of Western ponies, and plenty of lassoes and equestrian paraphernalia helping with the interiors direction of the three pioneer cabins that, along with the three safari tents, make up the campsite. Patchwork quilts are as de rigour to the average glamping destination as toasted marshmallows and fire pits, and Loose Reins does all three with finesse (our toasting might not have been that elegant, but given the little honesty store sold gigantic ones, they were certainly better than the attempts I used to make over a candle at Brownies about a hundred years ago). On the wooden terraces, you’ll find whittled rocking chairs slung with furry blankets, and chunky carved tables. Inside, rugs cover the polished floor boards, and fluted glass pendant lights hang from the wooden beams. There’s even a four-poster bed for the grown-ups, and a little cabin above a playhouse for kids. The furthest we got from leaving the site was wandering up into the forest behind to “hunt for bears”. The rest of the three days was quite happily used up toasting the aforementioned marshmallows, baking potatoes in the fire pit, and stacking the wood burner. We spent more money on logs than food, and the little boys were quite happy practicing their lassoing and firing nerf guns into the trees, the larger boy and I drank red wine and watched a very small slice of the world go by. Oh, and I almost forgot. There are hot showers and flushing toilets in all the tents. Not so different from the fancy Spanish hotel after all. To book a stay, log onto loosereins.co.uk.